The gaming marketplace is filled with arena shooters. There's such an overabundance of them that it's hard to find any true standouts. And when I heard a tagline like "Halo meets Portal," it felt easy to just dismiss it as marketing hyperbole. But Splitgate: Arena Warfare feels like more than a mere gimmick. Indie developer 1047 Games looks to deliver exactly what it promises. Shacknews traveled to TwitchCon over the weekend and went hands-on with the game formerly known as Wormhole Wars. And after a few sessions, the big takeaway was that the development was well on its way to crafting something amazing. Splitgate's presentation models itself off of Halo. Visually, it does look strikingly similar to Halo 5's Arena mode. There's the futuristic aesthetic, but the resemblance goes beyond visuals. Maps are designed with heavy verticality in mind, along with closed-off corridors designed for close-up firefights. Helix, the new map featured at the show, also featured some long hallway stretches, for those looking to plus their opponents from a distance. Different weapons will also spawn across the map, leading to a frantic race whenever something like a sniper rifle or a rocket launcher comes up. Of course, where this game separates itself is with the use of portals. Do the portals operate like Valve's original puzzle game? The answer is a resounding yes. Only certain patterned walls can house portals, with players able to place their portals along any of those areas. The game will keep track of every player's portal. Players will be able to see through their own portals, but not through the portals of other players. They'll only be able to see that those portals exist. They can risk running into those opposing player portals, but there's no guarantee they'll lead anywhere good. With that said, the developers are discouraging spawn camping with a few visual indicators. Enemy portals will glow bright when there's an opponent standing near the other side, allowing for players to act accordingly. Beware of the jerk who will stand next to an active portal and camp it with a sniper rifle. It's one thing to insert portals, but Splitgate impresses further by nailing the portal physics. Valve's game encouraged players to travel great distances through forward momentum and perpetual motion. Those principles are fully in place in Splitgate, allowing for quick traversal and also for some amazing circus kills. 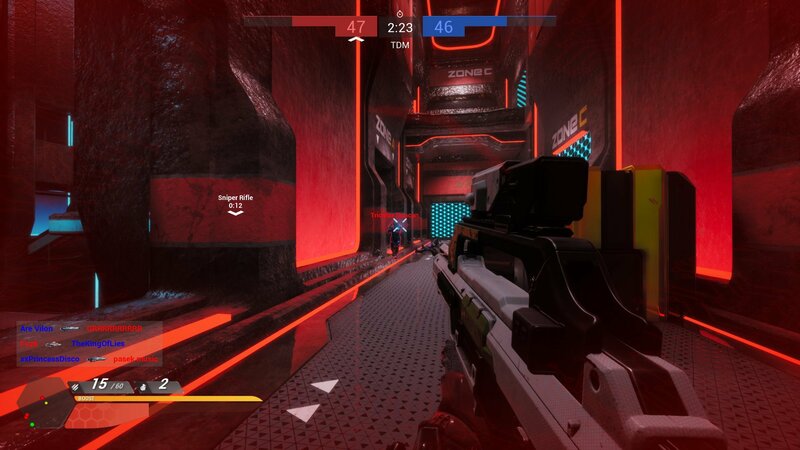 For a game that's in a closed alpha state, Splitgate: Arena Warfare is coming along better than can be imagined. On top of the novel concept, everything appears to be perfectly balanced, given the game's lack of classes or loadouts. Splitgate: Arena Warfare was a big hit at TwitchCon, with casual players and Twitch streamers alike lining up to give it a shot. It won't be out anytime soon, but those interested in giving it a try can attempt to sign up for the game's closed alpha on the 1047 Games website.